A Political solution to the Chief Justice of Nigeria Walter Onnoghen crisis of integrity rocking the Judiciary is in the works, The Nation has learnt. A 12-man Nigerian Bar Association (NBA) team has met with Vice President Yemi Osinbajo on how to resolve the row over Justice Onnoghen’s suspension. 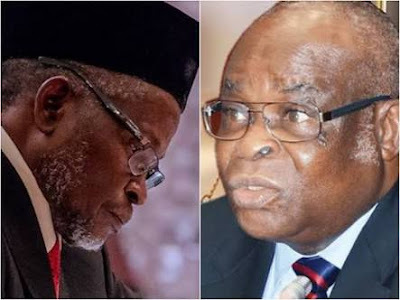 The session at the Presidential Villa was to seek a “soft landing” for the CJN, who is expected to resign in what a source described as a “win-win” situation. There is a six-point terms of resolution to be delivered to Justice Onnoghen through his confidants, relatives and friends, who will be expected to persuade him to quit. According to sources close to the talks, the NBA team, led by its National President Paul Usoro (SAN) and two former Presidents met with Osinbajo on Sunday night till the wee hours of Monday in a frank session. Also at the meeting were senior lawyers, including ex-NBA President A, B. Mahmood (SAN), Adegboyega Awomolo (SAN) and others. A source in NBA, who spoke in confidence, said: “I am aware that 12 of our leaders met with the Vice President, who is a senior member of the bar, on how to find a lasting solution to the crisis in the Judiciary. Some of them have briefed us that they went to the Villa to meet the VP. “The meeting reviewed the issues which led to the suspension of Onnoghen, including the allegations against the CJN, the filing of charges at the Code of Conduct Tribunal, restraining orders by some courts and the ex parte order by the CCT. “Our leaders restated the fact that they disagreed on the procedure adopted by the government in handling, Onnoghen matter. They virtually repeated the case presented at the CCT since some of them are Onnoghen’s lawyers. But they said the National Judicial Council (NJC) ought to have handled the matter. “They also faulted the government for a allegedly trying to desecrate the Judiciary since Onnoghen symbolises the highest authority in this arm of government. “At the end of the day, they sought for soft landing for the CJN who has no immunity under the 1999 Constitution. Responding to a question, the source said: “Well, we were told the VP who was with some unnamed people, accorded the NBA team utmost respect. They said he listened to them and assured them that President Muhammadu Buhari or himself will never do anything to destroy the Judiciary. “The legal and moral burden on Onnoghen were mutually discussed at the session by both the NBA and the government team. It dawned on everybody from NBA that the minimum the government will accept is the resignation of Onnoghen. The VP is said to have assured the NBA team that he will convene their requests to the government. consensus on the need to clean up the Judiciary (long term measure). The source added: “To be sure that the parties will keep to the terms, it was agreed that as Onnoghen is quitting his job, the government will simultaneously withdraw the charges against the CJN, the source said. In a separate development, a minister confirmed last night that some representatives of the CJN had opened talks with the Federal Government on “how to resolve the crisis in the bench” by the two arms of the government. The source said: “I think dialogue is ongoing but I cannot say much on this. It is in the interest of all to resolve the logjam before we go to the poll. 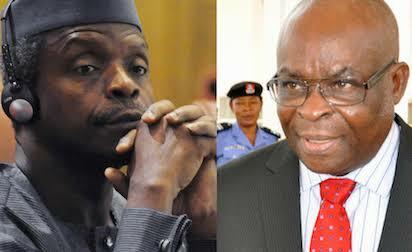 “The stage we are now is the demand that the CJN should be allowed to retire without prosecution. Those sympathetic also do not want the cash in his accounts seized from him. They were of the strong opinion that the Federal Government also erred in suspending Onnoghen with a suspicious order from the Code of Conduct Tribunal (CCT). “The government believes the CJN cannot go without forfeiting the huge cash. That is the challenge at hand.